This first image is just wonderful to me. What a priceless moment. 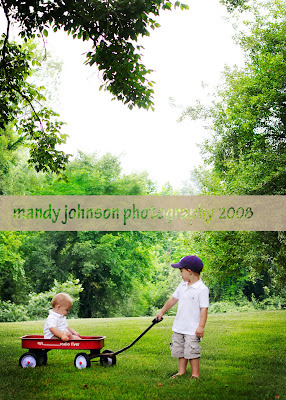 Big brother pulling lil brother in an old red wagon…I mean really. Jenn, you need to hang this large in your home! It just..whispers to my heart! Yes, they look so much alike. I loooove his white spiky hair in this! Not to mention his sweet serious face. Would you look at the color of his eyes….dont you wish you could make colors up like God can. Lil C is a HUGE sports fan. He loves football and baseball. So of course his cap had to be in the portraits. I love his one of him jumping. So darn cute! This is one of my fav spots and the kids always think Im totally coo~coo for putting them in the middle of the road! I love my job on these days. As with everyone alot of days I under appreciate my job and what a blessing God has given me. 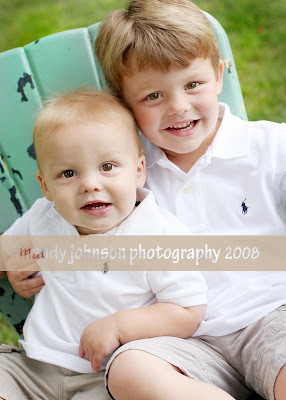 Then a session will make me remember that I am able to capture children doing what they do best. Being THEM! They dont know any different. Pure honesty. The biggest gift God gave us is our children. We must remember these wonderful moments with them. We must teach them about so many things and we must capture them as only they are! They grow up so fast and pictures will help us remember what a gift they are! So..on that note I am going to go play with my kiddos!